Installing SWIFT is not different from installing any other WordPress theme. SWIFT looks great with the default options but spending a few minutes on the options page will give you a unique look to make your blog stand out from crowd. SWIFT is actually a infinite number of themes packed in to one 🙂 . Download your copy of SWIFT theme, and unzip the file you have downloaded. Upload the entire folder on to your server wp-content/themes. The template files should thus be here now: /wp-content/themes/swift-vX.X.X/. You can also upload your zipped file via CPanel and extract it. Log into your WP admin panel and click on the Appearance tab –> themes. Now click on the SWIFT theme to activate it (see the first screenshot below). Change the permissions of swift/cache folder to 777 and swift/custom-styles.css to 666. Your blog is now powered by the fastest SEO friendly, cross browser compliant, Adsense optimized, server friendly theme. Note:If you are using WordPress 2.7 or higher, you install the theme directly from the admin dashboard. Previous Post« Previous Swift 2.0.4 is out with a friendly options page and much more.. This theme is excellent. Thank you Satish. Maximum width supported by swift theme is 980 pixels but I want it to increase more.. Please suggest how to do it???? Hi, Just getting into Swift. Would like to add a font to match our product labelling. I have found the “enable custom fonts” checkbox and see how to select a font for the home page header but how to add a font – want Papyrus font for some things. We’re using your theme at tribalblogs.net and it’s great. I’ve been able to customize all of my colors except for the blue box that says Post a Comment and Submit Comment. Where is the coding? I know which html color code I want to use, I just can’t find the right place to change it. I figured it out! I feel like the mouse who found the cheese and lived to tell about it. It was in the stylesheets. this first time I use swiftthemes, I very like this theme, friendly look, and more great option and upgrade was make for this theme, thanks before. please tell me how to properly configure the widget Swift 125 * 125 ads that it displays ads. what I do, go to the swift option in the management of banner ads in the box # 1 enter the URL where the jpg folder with the jpg, it is loaded on my site, then in the Enter destination url (link) here prescribe URL showing on partner sites image.jpg but it does not appear in Swift widget 125 * 125 ads. Tell me please what I’m doing wrong …. I am currently using version 4.1.4 stable version and i wish to countinue like that but it dont have author bio for post pages. i would like to add author bio box with related post in it just like the one below this post(Black box) to my blog. Can you help me out….. ??? in /uploads/swift_custom ??? is it called “custom-styles.css” or “custom-style.css” ?? so not “swift/cache” BUT “/uploads/swift_custom/cache/” ?? I’ve been using this theme since February but it is only now that I’ve really started tweaking with it (downloaded the latest version too), and I should say it is AWESOME!!! way, way better than the themes I tried and seen on other blogs. Got a question. I know this has been asked somewhere here but I tried looking and couldn’t find any. Anyway, my question has something to do with the post titles on the homepage. How may I reduce their size? I have the code. Now I need to know where to go to install it. when i install theme with wp-admin panel, swift themes automatic updates it 5.25 to 5.28, but i want to install latest version. I have chosen Swift theme because it is as easy to handle as it looks good. Yet, for the first time ever, my latest installation – http://herbs4all.com/blog – refuses to read my adsense codes… After triple checks… I am unable to find the answer. Anyone ever had the same problem ^ Anyone out there with an answer. I am wonder if i can get the Twitter and Facebook widget at my site, i am unable to find one at current version. Thanks again, have a nice day…. Remove what you have pasted there and save changes. I installed swift through wordpress and it seems that it’s missing option. Under the “layouts” tab i don’t have all of the available layouts that you show in your tutorials and I also don’t have the option of creating a child’s theme. Can you think of a reason for this? get the latest version from here. Can someone tell me how to change the header height to larger? And it just doesn’t look like your picture. I did have version 5.14 working much better… But the new version is not working for me. Is your wp-content/uploads/swift_custom folder writable?? Sorry, I just realized that i accidentally removed custom-styles.css file from the swift/includes folder, copy the custom-style.css from the earlier version to the new version and then activate the theme. Hi there. I installed Swift and it’s working well so far. I installed directly from the admin panel. However, the options I selected when I first implemented it yesterday, such as which categories featured posts pull from on the homepage, can no longer be accessed. The only two links under Swift Options are for Options and Design Options. Neither show the layout options again, nor can I find how to add new categories to pull from. The ones I selected were a little light, so I don’t have the content populating as I’d hoped. Any ideas? I am not sure if I can do this manually now, but I am not seasoned with php. Sorry if I’m wrong to answer, I though the Layout Options you can find inside “Design Options”, Category Featured Post at “Swift Options >> Home and Archives” and you can add category name to show on navigation is form “Swift Options >> Header” down to the bottom. I can see now itself, that you are going to be the competitor for DIY Themes 🙂 Hats off to you Satish. What it means, and how I do it? please explain step by step, cause i dont understand. Those permissions are applied automatically in the new version. I managed to install the theme without hitch except that I could not make the post slider work. I know that to enable the slider, I need to modify the permissions like swift/cache and custom styles.css. Now my problem is I cannot find the cache folder? i hv to enter hole feed burner link ? My dropdown categories aren’t working properly and appear behind my posts instead of infront. can anyone help me please? LOVE THIS THEME!! just installed…getting to know it a little bit:) Will leave more comments if Ihave questions:) EXACTLY what I was looking for! How do I upload my custom logo and have it become my header? Do I upload directly to a specific place within the swift theme? I am new to the swift theme. I want to ask why the About page is not visible on my blog. How do I make it visible? I really like this fully loaded theme. Thank you. I’m having the same issue. How did you resolve this? How can I have a left and a right sidebar. In previous versions it was very easy. That layout is removed from the v5.0 of due to difficulties in implementation. I’m working on it, and almost there. It will be included in the premium version of SWIFT. In the process of switching to Swift from a (basic) blogspot template. 1- I want to ‘choose’ which stories/posts are on the front page. Your theme makes me look GOOD! What a great theme. I got a couple of pages to “nest” properly and drop down under the parent page titles on the top navigation bar, but then it stopped working. The only thing I could find on the forum was someone did an upgrade & it worked. My version is up-to-date. I made a mistake with my registration at the support forum & although I can log in I am not activated. I have sent an email through “contact us” so, hopefully, that can get solved and I will be able to post future questions there. I’m just really excited to keep building this site and would like to get the drop down child pages working… I already have a bit of content there, but no way for people to see it or navigate to it. Thanks. Again, awesome theme. I’ve worked with a few and this one scares me a little because I am just a regular point & click computer user, but so far almost everything is intuitive and working really well. PS: I activated your account on the forum, you can post your question on the from from now. I use version 5.0 and there is no check box to activate Banner Ad Management (125×125). I have used this feature in the prior versions of Swift and I would like to use it again but there is no check box to activate. Banner ads are moved to widgets since version 5.0. That was very helpful. Now I am trying to choose a different topic for the slider. Only the recent posts works as a category for the slider. All the other categories are blank in the slider. I cant see more than 2 mah box… how can i change this? That guide is for the previous version of SWIFT, I will put a notice there. Im trying out some new themes and this one looks nice. I noticed that my images which I set with width=20 initially load as 20 but then directly get resized to their original size. Is there anything I can do about this? Give me the link to the page where this problem is seen. 4. Some thumbnails for excerpts and for the slide are not showing. instead i get the pencils. You have to add the thumbnail url manually in custom fields to those posts. 5. Check the date options in wordpress general settings. Thanks a lot for your theme…This theme is working fine but only problem is I am not able to see any thumbnail image on home page…I tried everything but it is not working out….Please help…. Is the font size, font type font color editible in the title of a post or page? It appears the font displays as Times and quite large. Hello, I am trying to change the order that the navigation categories appear in under the logo. Is there a way to do this? They appear to load alphabetically? Thank you. I want to display the picture on the home page. as in the example. got this error and am not able to my options page, how can change what I need to in order to make it work? this theme cools but can you tell me how to put ads in this theme ? why when I install the plugin YAPP sidebar on my blog falls down? Hello! Thanks so much for your hard work! Is there a way, on the home page, for me to make the boxes a little less vertically large? Basically what I mean is I’m trying to fit two horizontal rows of three ‘content’ boxes in the main/home section. Like on all our homepages, a little picture above, and the description. I only need a very little bit of room for the text description after the picture that is posted above the story, and I would like to reduce the downward length of the rest of the box which is all empty space since the text is rather short, before the next lower line of boxes. Know what I mean? How does one REMOVE the “categories” widget that ppears by default in what appears to be a Wide-Right sidebar? With the category drop-downs at the top of the page, it seems redundant to have it also on the right and I can’t figure out how to remove it? thanks for a great theme! We are having a problem with the banner height in explorer – basically the banner height is 150 but it is being cut short in explorer. Note: This is custom made for Ji, May not be suitable for other blogs. thank you so much for the custom code. I’ve just uploaded it and unfortunately the banner is reduced in height to maybe 50 pixels. I’ve reinstalled the original custom-styles.css file so you won’t be able to see it in action. My theme options don’t appear in my backend when I click on “Swift Options”. The page opens, your header opens, but none of the options appear. Help! I guess you are using internet explorer. Use firefox. You have a very nice header and colour scheme, keep up the good work. I Only need a couple more tweaks now…in all the screenshots of the theme there are 3 columns for posts on the main front page, I’m only getting 2? Where can I change this setting? And finally I’m including a paypal button in each post which seems to have acquired a blue border around each one. How can I remove this border from around the buttons? Thanks for all the help with this..but just wondering now if the image thumbnails can sampled from the top of the image rather than the middle or can the thumbnails be resized to include the whole image, just smaller like a traditional thumbnail? – Can I scale the size of images in the sidebar? If you look at my site (www.sarahchauncey.com), the square icons I’ve inserted are tiny (around 20×20), but when published, they’re much bigger. Same with the rectangles. Also, how do I increase the font size of 1) the blog tag line and 2) the post text? I know it’s in style.css, but I’m not sure which code refers to those two elements. Cheers, and thanks again for doing a great job! 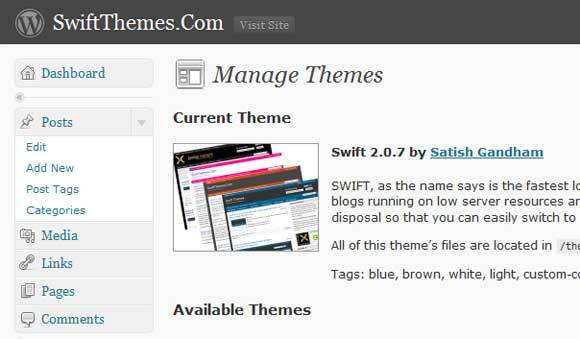 this themes very simple and very good, i interested to install on my blog…. Can you remove the category navigation altogether? I’d rather have a category list in my sidebar than as menu navigation. ps if it can be done, can anyone tell me how to remove the catagory navigation under the logo and also how to remove author info in each post? I dont want my gravatar showing. use the single.php file from this copy of SWIFT to remove author gravatar. I’m working on setting up my site with your theme with I think is great. “Sorry, the comment form is closed at this time.” on the bottom of pages. I don’t wish to have any comments on these. Thanks again for creating such a useful and functional theme. That will remove it from both posts and pages where you have comments closed. Alternatively, if you’d just prefer it to say something else, versus being gone all together, then just change the words. PS don’t look for the [code][/code] words. That’s something I thought I might need to do for the rest to show up in the comment. LOL Sorry about that. why page of Plugin Settings Related posts (YARPP) No related posts. although the script has included in the plugin settings YAPP. Because you dont have any posts related to that post. Great theme! Is there a way to set the photo that appears in the slider based on which category the post is in? Post your question on forum. We have this theme installed on our blog. I am just wondering how we go about increasing the number of posts from 3 to 10 on the slider though? I have been through the Swift Theme Options and couldn’t find anything there specifically for this…. it may sound like a stupid question, but how do you change the permissions? This is a great theme! It’s very customizable and really well thought out. It’s a great theme for our http://www.settlingcreditdebt.com site. I am using 4.07. When I clicked on “display exerpts” in the home page options, all my thumbnails disappeared on my home page. When I disable exerpts, the thumbnails display again. How can I get to enable excerpts with thumbnails to show on the home page? 2 = In The slider Pictures are not showing only last post picture and text is showing. any 1 guide me how can i will fix it? SWIFT has built in support and custom styling for this plugin. You dont have to do any edits. hey how did you add all these buttons like “bollywood review” “mobile review” “videos” “visa embassy” below the header? in your site.? What is that fucntion for?? on my slider only last post picture and text is showing. and page any 1 guide me how can i will fix it? pictures are not showing in my main page and also in showsilde. guide me what can i do? how can i will fix it? pictures are not showing in my main page. guide me what can i do? how can i will fix it? I have a quick question. I am trying this theme for me new site. On my other site (www.fastharry.com, Atahaupal)), when I paste a post to the front page the hyperlinks work. When I do it on Swift on this site, they come through as solid text, non clickable. And yes, I am enabling them through links…Thanks! First I must say this Swift Theme is great. I’ve been using it about a week now. to change the font style and size. How do you do that? I corrected this using the custom css coding under the “colours” page. This theme is amazing, very tweakable, nice looking and its the only thing that runs well on my awful godaddy hosting. Best WP theme ever… Many thanks! how i add more post in tht slide show on main page ?? Does anyone have some links to their sites so I can get some ideas of how to implement this theme? How can I add an external page as one of the menu button to my blog http://2learncad.com/blog ? for example when I go to wordpress Pages, and Add new page. I want that new page that I create to directly open another site with link http://astore.amazon.com/2learncad-20 when someone click on the button. why my popular post is not work at my home page ? Everything is fine on my blog but except one thing. I want to increase my “homepage post”.. Right now it shows only 4 post. So i want it to be 6 0r 7. And also the “popular post” i set it to 10 but it shows only 5. Whats the matter here. Hi there I am using this on my site but for some reason on my article posts the background color changes, please help thanks! Thanks, the theme is looking great so far. One problem I am having is that when I add my logo to the header, the title of the blog disappears. Is there a way to get it back as my logo is only a picture and doesn’t have the title in it? Thanks! It’s not possible, add text in your logo. I am having problem , I add my logo to the header, following instructions that was given but nothing is happening! What is the problem? Thanks for the reply. I can add the text to the logo, but am afraid that the search engines will miss it. There isn’t any way to have a logo and text? You dont have to worry, blog name and title are added to alt and title tag for image and link title. Search engines wont miss them. These media settings work only if they are set before the thumbnail are created, once they are created these new media settings won’t apply to them. Im adding automatic cropping feature in v4.0, that should takecare of issues like this. Thank you very much ! I deleted the pic and added a similar one back into the post and the slider shows it correctly ! yeeha… keep up the awesome work and thank you for such a quick reply. You dont have to enter the alt text, alt text is added automatically. Are you still having problem? I don’t see any problem in your blog. My first blog will be with your theme. Congratulations. Just a question. I see slider is limited to 184 characters. How does a person change the content for the tabbed display beside the slider (to the right) on the home page? Right now you this has to be done manually. i’ve looked this theme in my friend homepage, this awsome and i follow the link here. i will try it. In the latest version of version of SWIFT i reduced the slider speed to 6 Seconds form 3.
there will be a number either 3000 or 6000, change it to one of your choice. Thats slide duration in mill seconds. Pete someone here had figured how to do that. I guess there was a comment here only on this. Try searching it. turns out I can edit it like any other file in notepad. Not so scary after all ..
don’t know if you can change this setting into a variable to set in admin panel but may be a future feature request. (only showing pictures may require different settings than text, quick setting in admin would then be cool). Is there a way to increase the font size in the slider? Add any size of your choice. Feel free to drop in if you need any more help. Wish there was comment reply subscription option by email here! It is so rare to get such prompt replies and follow up! Great job man! Have selected category for “Featured Category” and set the “Number of Featured Posts.” BUT the selected category does not appear on the home page slider. replace js-functions.js in swift.includes with this one. Thank you, but tried it and that is even further from what I want! Will go back to the original. Isn’t there a way to adjust the timing? A slider that holds an excerpt, must allow people time to read it. Even if they are only looking at the pictures, it should not be too fast. A nice classy fade effect, nothing harsh or fast, is preferred. Thank you so much for all your help and your quick replies! Glad to know that you solved your problem, thanks for sharing. I just installed Swift from wordpress and am trying to figure out how to have it show the whole post on the home page instead of just the first sentence or two. Can you clarify for me how to do that? This template is beautiful btw! Hi Satish, Still puzzled because when I went to follow your instructions, the box was already unchecked. Any other thoughts? Do you have the latest verswion?? give me the url where you are using it. How can we remove about me page from home page? Instead of this if we put vertical slider bar for different post or advert then this is more beneficial in terms of revenue and page views. I’m replacing the about section with tabs, and featured post with a clean content slider in the next version of SWIFT. It should be out this monday. You will have the option to disable the slider if you dont want it. Thank you, satish for such a lovely theme for free. I will use it in my next blog. Thank you again for giving option for slider bar. Yeah, I’m using it and it provides most important widgets and options that a blog must have! There is a problem in Feature post.. it doesn’t show the image if its not uploaded via WordPress itself. Lets say i uploaded an image on tinypic and put the direct url of it, it doesn’t show up in Feature post. Is there any way to fix that? first image of the gallery associated with that post is shown as thumbnail. I doesnt take images uploaded outside. next version of SWIFT will support this feature. I will try to releaase that asap. Thank you Satish for your quick response, I will be waiting for the next release :). nice theme. but did this theme support gravatar? how to do gravatar? help me pls, thanks. Sorry there was a silly mistake from my side. I think I didn’t install the theme properly. After reinstallation it is working like a charm. Sorry for the trouble. There is no problem with SWIFT, you are having some unclosed HTML tag, that’s creating the problem. Check the posts on the home page for any unclosed tags. there should not be any conflict between atahualpha and SWIFT, it might be due to some plugins you installed recently. Yes it was working fine. I have sent u an email as well. What is the solution for it? Sinle page or post is working normal only home page is throwing that error. Strangly atahualpha 3.4.2 stopped working after installing this theme. Only version 3.4.1 is working well that is with some difficulty. I cant really say, without it being live. Most probably, that might be due to a div which you forgot closing in your post. Are the pages containing the previous posts fine?? Most probably they should be. It is not working properly on my website. The homepage doesn’t look good, single page is working fine. I think this theme is awesome!!!!!!!!!!!!!!! I am going to install it…. Sign-up for our latest WordPress tips/tricks! Lazy Loading of images with under 1KB overhead.